The topic of arbors and pergolas for January’s Garden Bloggers’ Design Workshop has gotten me thinking about some of the climbers I tried on my new arches last year. 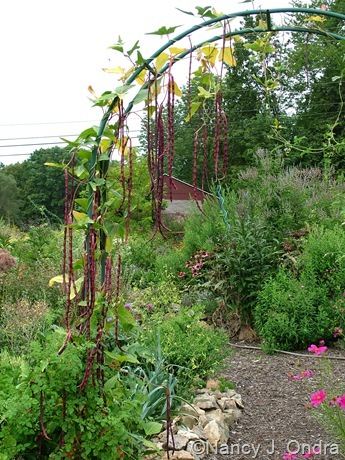 I’d decided that the orchard arch ought to have something edible, so when I found ‘Red Noodle’ (also called ‘Chinese Red Noodle’) bean in the Territorial Seed catalog, it seemed like a good choice. 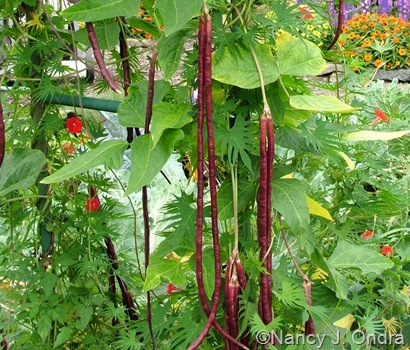 I’d grown the green ‘Yardlong’ bean (Vigna unguiculata) in my old garden and liked it, but it wasn’t especially ornamental, so a red version sounded ideal. I had visions of it creating an effect something like a bead curtain, but it didn’t quite work out that way, because the vines weren’t as dense as I expected. I think that was just as well, for two reasons. For one, the pale purple flowers were always covered with ants and wasps, which made picking difficult and would have made walking through them downright unpleasant. And two, the deep purple-red beans themselves (which reach closer to about 18 inches, rather than a literal yard) were quite creepy-looking: rather like lumpy little snakes. Will I grow ‘Red Noodle’ again? Maybe – if only to actually try tasting the young pods. I never did get around to harvesting any of them. Those are a bit freaky! Cool but freaky! It is a good idea to try a few different plants every year. So little time, so many plants! A related word of advice: If you snip off the over-mature beans, do not simply drop them on the ground or toss them into the garden. I generally don’t mind snakes too much, but after months of getting spooked by the pods I had strewn around, I became touchy about the whole snake concept. Freaky indeed! But we don’t know how they taste, or even how to cook them, you must grow them again and give us the thumbs up or down. Frances, if you’re expecting information relating to cooking from me, you’re going to be disappointed. But I’ll tell you what: I’ll grow them again and try to pick enough for Mom to cook, then I’ll report back. Golly Nan, I didn’t realize you had this marvellous site up here. I’ll have to dig around. I found it because I’m growing the noodles (from your seed, via the HPS/MAG exchange) and was looking for a bit of background information. Of course I’d seen them on your arbor back in September. 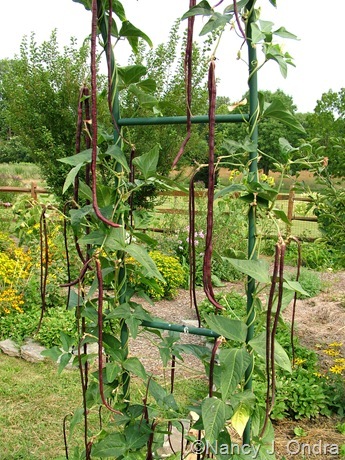 I’ll try to harvest some of the beans, and compare their culinary performance to our standby ‘Trionfo Violetto’ runner beans. Hi Rob! I’m glad you found me. When I Google plants I need info on, I usually find myself at *your* site! What a pretty photo!I came across your site while looking for some details on this bean I am trying for the first time.I live in Trinidad but I got my seed from Baker Creek.They germinated well. Mines are about two feet high now .I peeked into the background of your picture looking for something prettier but did not find anything. Your Red Noodle looks wonderful and the vines are loaded too.Hope that mine will be as productive as yours and I sure will sautee them. Welcome, Rachael! I hope your beans do well; I think you’ll really enjoy them. Mine are only 2 inches tall right now, so you’re way ahead of me. I’d be interested to hear what you think of their flavor!